Mix the marinade ingredients together in a bowl until the chicken is coated. Cover and place in the fridge to marinate for at least 2 hours. To prepare the sauce heat 1 tbsp oil in a non-stick saucepan, add the onion and fry gently for 5 minutes until softened but not coloured. Add the ground ginger and turmeric and cook for 1 minute. Pour in the coconut milk, bring to the boil gradually then reduce the heat and simmer, covered for 15 minutes. Chop the coriander roughly, including the stalks and add to the sauce and continue to simmer for 5 minutes then remove the pan from the heat and blend until smooth with a hand blender. Heat a non-stick saucepan, add the chicken and marinade, and stir-fry over a moderate heat for 10 minutes. Add the green beans and cook for a further 5 minutes. Finally pour the sauce over the chicken add the peppers and simmer for 5-10 minutes or until the chicken is cooked through. To make the sticky rice balls, using wet hands roll the rice into 6 equal shaped balls and place on a non-metallic plate, cover and microwave until piping hot. For zingy rice, add the zest and juice of a lime before rolling into balls. Cooked chicken works well in the recipe just reduce the cooking time to 10 minutes ensuring that the chicken is heated thoroughly before serving. Cooked leftover rice should be cooled quickly and then stored in the fridge for up to 24 hours. It can be eaten cold or reheated until piping hot. This dish works well with other vegetables too, you could try adding cooked carrots at the end or even a handful of frozen peas or sliced courgette. If you have fresh coriander leftover, chop it finely and freeze in ice cube trays topped up with water. Once frozen, pop them out and store in the freezer in a freezer bag or plastic tub. Next time a recipe calls for fresh coriander you’ll have some ready at your fingertips. Vegetarian Options Replace the chicken with firm tofu and use a vegetarian Thai paste. Freezing and Storage Tips The spare sauce can be frozen then defrosted in the fridge and used to create a Thai curry of your choice. 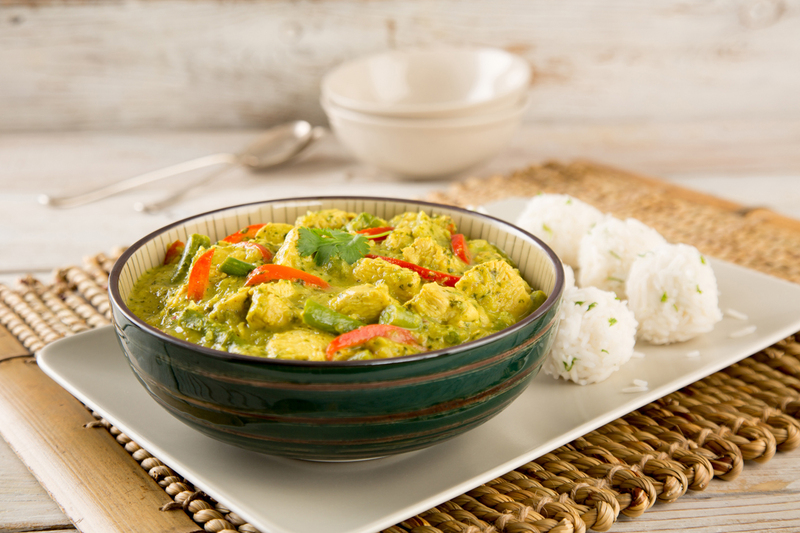 Store any leftover cooked chicken curry covered in the fridge and eat within 48 hours. When cooking a mince dish like this one it makes sense to double up and freeze a second meal for another day.